There are a few plumbing-related tasks that a normal (read: untrained) homeowner can do. Unclogging a clogged toilet, tub or sink is one of them. Most people own a plunger, since they’re standard “bathroom gear,” but don’t know how to properly work one, and make this task harder than it really is. Remove some of the water from the clogged toilet, tub or sink. It helps if you wear rubber gloves for this, especially if you’re removing water from the toilet. The reason for this is simple: it’s easier to unclog something if you don’t have water slopping all over the floor at your feet every time you move the plunger. It also helps the drain, since less water will be trying to go down it at once. Place the plunger into the clogged toilet or sink so that the rubber part of it securely covers the drain. The placement is crucial. If you are even slightly off center, the plunger won’t be able to get enough leverage. This makes it unable to pull out the clog. 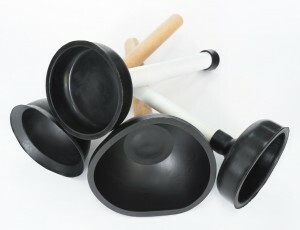 Push down on the plunger’s handle several times very forcefully. This allows the suction to reach the clog and either break it up or pull it out, unclogging the drain in the process. You may have to push down on the handle several times before the clog is undone. Remove the plunger and allow the water to drain. Follow up with bleach or a chemical drain cleaner (use sparingly and only if you’re sure that it won’t damage your pipes) to ensure that the clog is gone. However, if you’re still having problems, then it’s time to call in the professionals from your local plumbing company.